The staying power and flexibility of clay pavers is helping improve the look of many home surrounds. Littlehampton Clay Bricks and Pavers sales representative Bill Leggat said clay is “never boring” and pavers gave homes and commercial areas a vibrant feel. “There’s lots of colour, character and variation and they last,” he said. Littlehampton pavers are kiln-fired to 1200C with the colours locked in to create an elegant look. Bill said Littlehampton’s clay pavers were all hand-graded and their quality was “on the pallet to see”. He said even councils were increasingly turning to clay pavers as they saw the long-term value of investing in a product that not only looks good but has longevity. 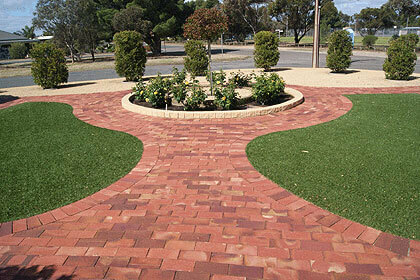 For all your paving needs, contact Littlehampton Clay Bricks and Pavers on 8391 1855.